Application: October 25, 2016 to January 10, 2017. 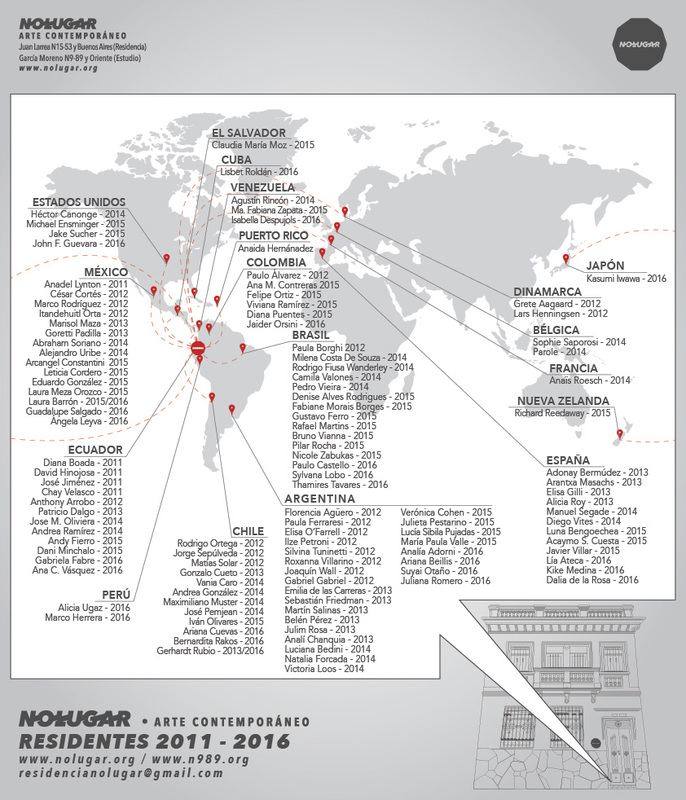 No Lugar – Arte Contemporáneo – in context with its Residence Program, opens call for 2017 artistic residencies, in the formats of artistic production and curatorial research. The Residency Program brings together visual artists, curators and researchers from all over the world to live and work for a period of at least 3 weeks in No Lugar, located in the center of Quito, Ecuador. At the residency, both artists and curators have the opportunity to develop an intensive process of production, which may take the form of exhibition, open studio, workshop or presentation of portfolios. Artist residence: This residence is directed to artists, performers, designers, illustrators, digital artists, filmmakers and people involved in the creation and investigation of contemporary art. The residence is intended to produce an artistic project to investigate and experiment with the city and the dynamics involving art production systems in a format of artistic residence. Curators residence: Intended for curators, critics, theorists, historians and investigators who come to produce their own curatorial or research project that will include Ecuadorian artists, or are related with the local scene. Artists, performers, sound artists, musicians, curators, and researchers that focus their practice on Contemporary Art can apply. CV and an updated biography written in prose with relevant work career, (Bio 7 lines). 3 images of previous relevant artworks. Description of the residence project, up to 300 words. Link to portfolio, in case it is on the web. NOTE: Images must not exceed 500kb. We recommend digital images to be 1200px X 800 px and should not be manipulated. Shared rooms between 2 people per room. Participants must complete a reflective journal, they can be done in video, text or photo to be uploaded to the website of No Lugar. Letters of invitation will be sent to those selected. Participation certificates will be awarded. Participants: The residence has a maximum of 6 people per month and is available during the months of: January to December 2017. Investment: USD$ 350 per person (3weeks), USD$ 450 (1 month) and USD$800 (2 months). Includes: Accommodation, shared dorms between 2 people, WiFi, dining room, bathroom, kitchen, workshop and studio for research, exhibition studio, monitoring, promotion and diffusion of the processes of residence, curatorial guidance. Not included: transportation costs to and from the place of residence, travel, breakfast, lunch, dinner, materials. Invitation letters will be sent to those selected. Applications: October 27, 2016 to January 10, 2017. Residence period: January – December 2017. Money send by Money Gram orWestern Union. All activities within the residence are represented and managed by No Lugar – Arte Contemporáneo.